The series entitled Demolition Sites was created in response to the transition occurring in Detroit’s physical and historical landscape. 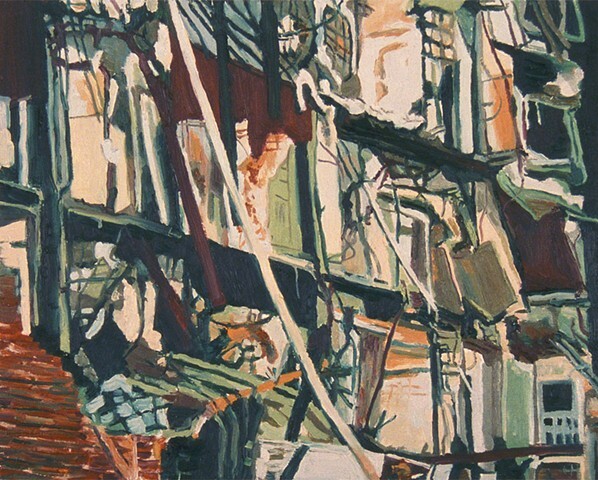 These paintings aim to document the fleeting state of specific buildings; Capturing a moment of a location’s appearance between what it had been and what the place will become. Working into the Night presents the action of tearing down an apartment building to make way for an extension facility onto the Detroit Symphony Orchestra Hall. There are bright lights aimed at the site as the construction crew works after dark.